For this final (awww. . .) Halloween entry, I've decided to go out with a Retro Review. So grab your wooden stakes and a warm coat because we're heading back to 1970 and the cold New England coast for some Dark Shadows! As usual with these Retro Reviews, let's wait a minute before we jump into the comic at hand and talk a little bit about what's in the background, shall we? We shall! 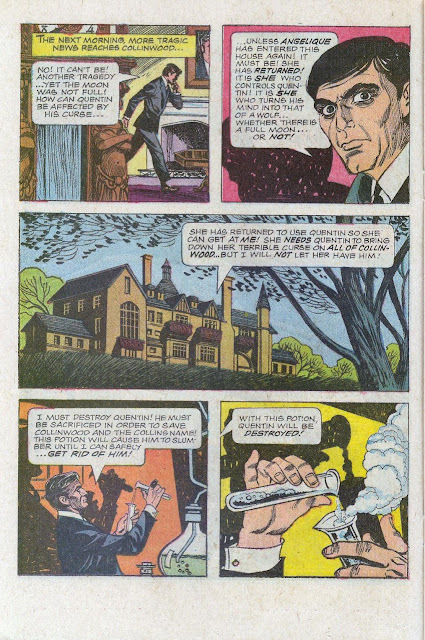 So. . .the basics for those not familiar with Dark Shadows is that this comic is based on a supernatural-themed soap opera that aired daily on ABC from 1966 - 1971. The stories were centered around the trials and tribulations of the wealthy, yet cursed, Collins family in Collinsport, Maine and mostly took place in a huge gothic mansion called Collinswood. There were 1,225 30 minute episodes that aired during the shows run. Stories featured vampires, werewolves, ghosts, zombies, mad science monsters, witches, warlocks, time travel and a parallel universe. The truth of the T.V. show is that it's. . .barely okay. It still has a lot of fans, but the show honestly doesn't stand the test of time. Viewed today, it looks incredibly cheap and cheesy. It has an interesting core, but the technology and storytelling of the time just couldn't deliver on the promise. This was also a show that filmed daily with scripts that were being written with a serious deadline crunch (sometimes they were finished AS the show was filming), interviews with the actors tend to talk about what an exhausting experience it was, so that didn't help much with the overall quality. 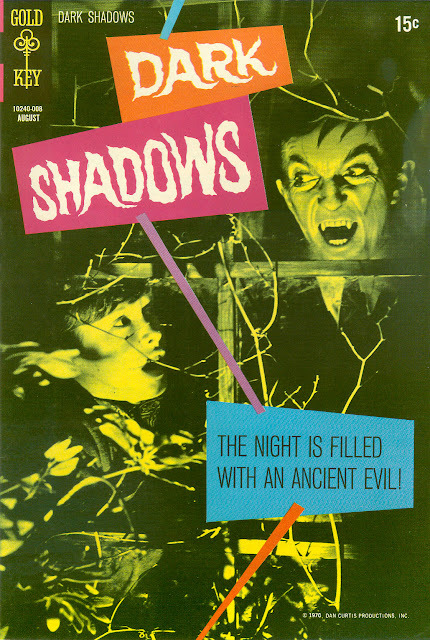 Enjoying the original episodes of Dark Shadows is pretty much an experience for established fans only. . .sort of like trying to watch the black and white episodes of Doctor Who. There was a short-lived revival of the show in 1991 that lasted 12 episodes. It's actually pretty good, but you can literally see the network stop giving a crap after about the halfway point. Then there's the 2012 movie featuring Johnny "seriously, screw that guy" Depp. I saw it before I swore off EVER consciously putting another dime in Depp's pocket after he destroyed any chance of me getting another Lone Ranger movie, thanks to his comedy portrayal of Captain Jack Tonto. It's more of a comedy drama and pretty much resembles the original Dark Shadows in the names only. It grits my Depp-hatin' teeth to say it, but the Dark Shadows movie isn't as bad as reviews make it out to be. . .as long as you realize that it is NOT the Dark Shadows you might be thinking of. It has a lot of good moments. They should have just named it something (ANYTHING) else and people wouldn't have disliked it so much. And seriously. . .screw Johnny Depp. 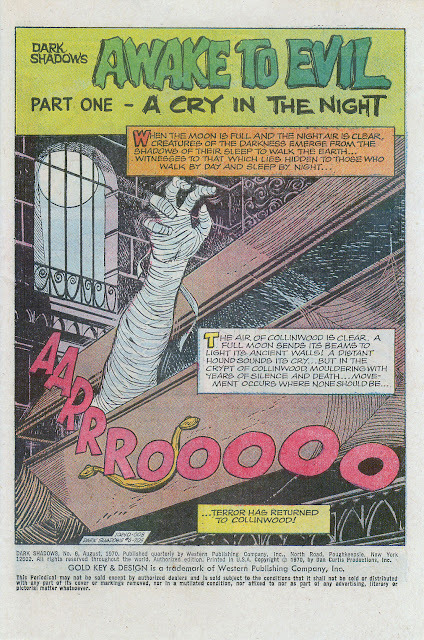 So that's a quick rundown of Dark Shadows on the screen. . .but we're here to talk comics. 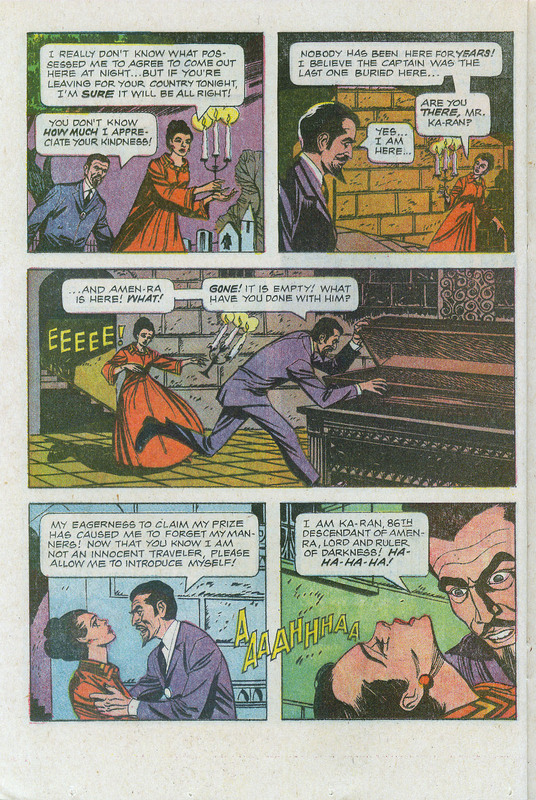 Beside the Gold Key series lasting 35 issues (including the issue at hand), there was a 4 issue run from Innovation based on the second T.V. series (I don't have any issues), and a 23 issue run from Dynamite in 2011-2013 that I have a few issues of. . .it's not bad at all, from what I've read. There's a few other bits and bobs like a Vampirella/Dark Shadows crossover mini from Dynamite and a Dark Shadows : Year One "Origin" mini (also from Dynamite), but I haven't read any of them and from the looks of it, nobody cares. . .so they may yet end up in Longbox Junk, if I ever run across them in the bargain box. As far as the Gold Key series at hand, there's remarkably little information I could find on it beyond the bare bones basics of years and numbers. The writers and artists aren't credited on any of the 6 issues I have in my collection (or any of the issues, as far as I can tell), and it was only through a bit of digging that I managed to find who worked on this issue. . .and even that bit of information isn't 100% solid. But enough of that. Let's get into this comic! Several mysterious deaths take place over the course of a single night in the town of Collinsport. Based on past experience, it doesn't take long at all for the townfolk to start looking toward Collinwood. . .the dark home of the cursed Collins family. At Collinwood, Vampire Barnabas Collins learns of the deaths and immediately suspects Quentin Collins, who he knows is a Werewolf. . .but he needs proof before he takes action, and so Barnabas decides to investigate in town. Barnabas hears the cries of a man being attacked. 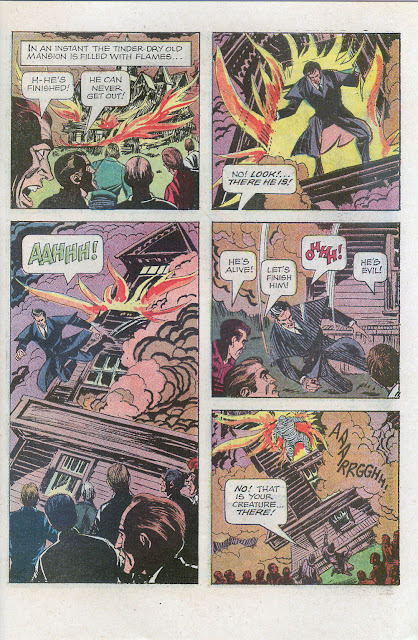 He arrives in time to save the man, but unfortunately, both the man who was attacked as well as an arriving crowd of townfolk see Barnabas and assume that he is the killer. 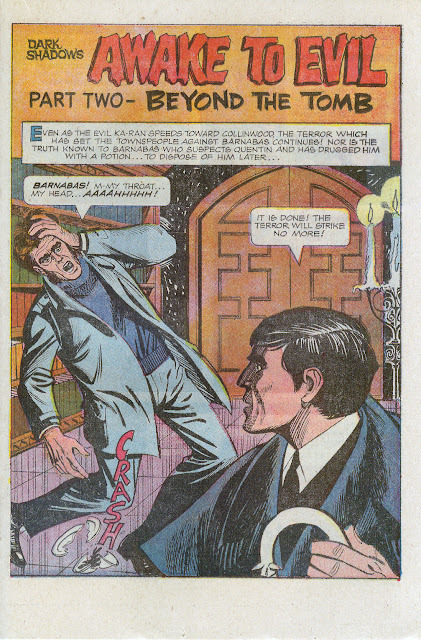 Barnabas escapes from the mob and makes it back to Collinwood. . .now convinced that Quentin is indeed the killer. That night, a mysterious creature rises to kill once again. When Barnabas learns of it, he decides that something must be done about Quentin, so he concocts a poison to incapacitate Quentin so that Barnabas can dispose of him when convenient. . .never realizing that he's completely wrong. MEANWHILE, IN EGYPT. . . Yes, that's right. . .I said Egypt. Flashing back a couple of days, we gaze upon the sorcerer Ka-Ran in the midst of a ceremony to raise the ancient mummy of the sorcerer Amen-Ra. 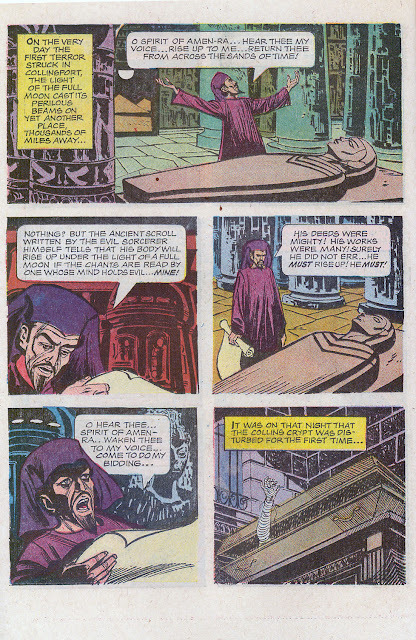 Ka-Ran is confused as to why the ceremony was seemingly not successful, so he opens the sarcophagus and discovers that somehow, the body of English adventurer and Sea Captain Nathanial Collins. . .the man who was killed attempting to plunder Amen-Ra's tomb. . .has been switched with Amen-Ra. Ka-Ran immediately assumes that if Collins is in Amen-Ra's tomb, then Amen-Ra must be in Collins' tomb. . .and so he makes ready to travel to America. 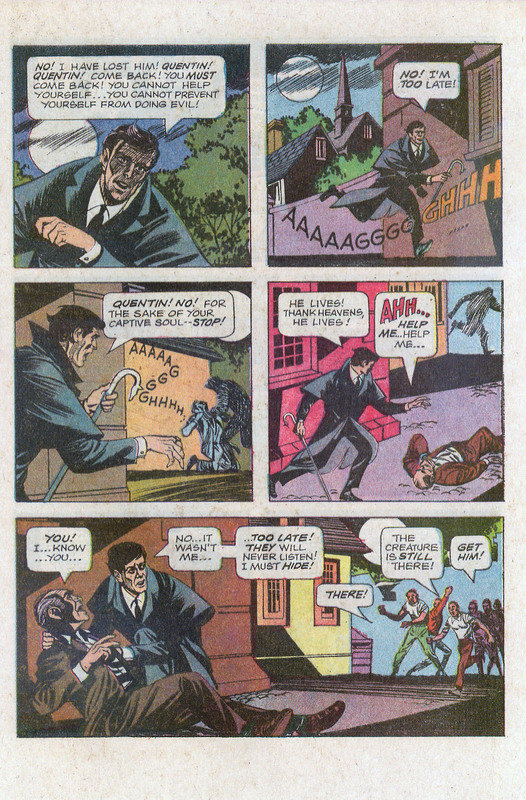 Barnabas Collins finally confronts Quentin Collins and poisons him before dragging him into the family crypt in order to kill him. . .but in the process he sees Nathanial Collins' empty coffin and realizes that he's got the wrong killer. So he just sort of drops Quentin to sleep off the poison and rushes into town to try and find out what's going on with Nathanial Collins. MEANWHILE, BACK AT COLLINWOOD. . .
Elizabeth Collins entertains the Egyptian Sorcerer, Ka-Ran, who has arrived at Collinwood with an extremely sketchy story about how his grandfather was good friends with Nathanial Collins and he traveled all the way to America JUST to see his tomb. Never mind that it's the middle of the night. Elizabeth falls for Ka-Ran's story and takes him into the tomb. . .only for him to discover Nathanial Collins' coffin empty. He gets aggressive and reveals his true identity, making Elizabeth pass out. . .from the sheer evil of it, I guess? 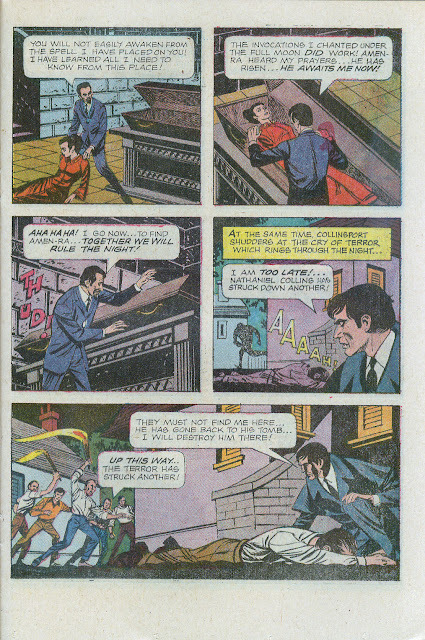 Ka-Ran stows Elizabeth in Nathanial Collins' coffin and heads into town to see if he can find Amen-Ra. In the meantime, Barnabas Collins has arrived too late to save yet another of the townfolk from being murdered by the marauding mummy. Worse, an angry mob finds Barnabas suspiciously hunched over yet ANOTHER dead man and he has to run for his life AGAIN. Barnabas makes it back to Collinwood, but the mob is on his tail and he has to run from them, leaving things nice and quiet for Ka-Ran to return after wandering around town and finding nothing. Ka-Ran decides to camp out in the Collins family crypt and wait for Amen-Ra to return, but as the rays of the moon reflect off of his "Moonstone Necklace" Quentin Collins. . .who has been laying forgotten and unnoticed on the floor of the crypt all this time. . .is revived and transformed into a werewolf! 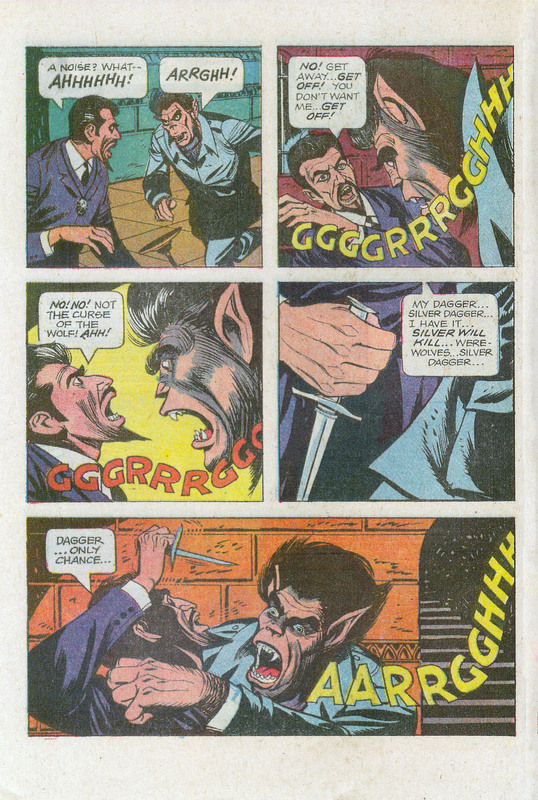 Luckily, Ka-Ran just HAPPENS to carry a silver dagger for these sort of unfortunate situations, and the sorcerer and werewolf start to battle in the Collins family crypt. 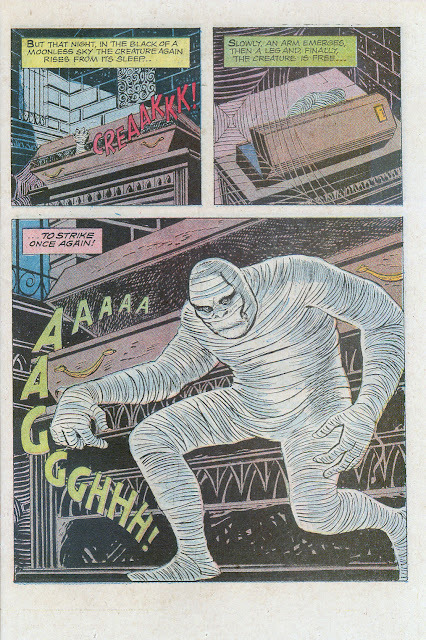 Meanwhile, outside of Collinwood, Barnabas (still on the run from the townfolk) accidentally runs into Amen-Ra and a Vampire on Mummy battle ensues! Barnabas chases the mummy to an abandoned mansion. The mob of townfolk arrive on the scene and see Barnabas going into the house. They decide to burn him out because they are literally carrying torches and pitchforks. As the deserted mansion goes up in flames, Barnabas jumps from the window. 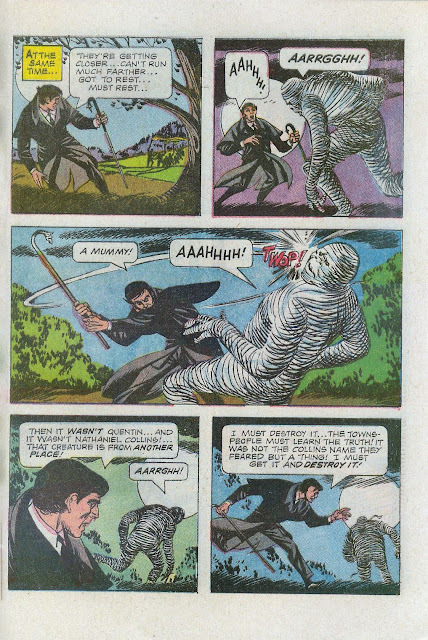 The townfolk are ready to finish him off, but then Barnabas points out the flaming mummy and manages to convince them that it is the real killer he was trying to save them from all along. The townfolk apologize and go on about their business without asking any questions about WHY THE HELL A LIVING MUMMY EVEN EXISTS. Obviously those are some jaded townies living in the shadow of Collinwood. Barnabas returns to the Collins family crypt to discover Elizabeth and Quentin trying to figure out what happened. Ka-Ran is nowhere to be seen. Quentin tactfully decides not to mention how Barnabas poisoned him and nobody asks about Nathanial Collins' empty coffin, the weird Egyptian guy who was REALLY interested in the Collins Family tomb, the mob of angry townfolk wandering the grounds of Collinwood, or wonders why the old Palmer House over there is up in flames. I guess when you're part of the Collins family, it's best just to leave things alone and take a sort of happy ending when you get one. Vampire vs. Mummy and Werewolf vs. Evil Sorcerer with a nice sprinkle of torch-wielding village mob. It's got all the parts for a great Halloween monster vs. monster story. Unfortunately, those parts are fit together with about as much effort and imagination as a snap together model. This story is so full of coincidences to get all the parts into one place, that by the end of things it's almost straight comedy as characters barely miss each other, accidentally run into each other, and basically end up stumbling into a conclusion where the villain just sort of vanishes and nobody wants to talk about what just happened. The art on this story is extremely workmanlike and just borderline bad. The depiction of Quentin as a werewolf makes the T.V. show's cheap makeup look like artistry of the finest caliber. It's laughable, how bad this artist draws the werewolf. The rest of it is on the bad side of "okay". The art tells the story, but that's all it does. What we have here is an obvious cash grab. From the completely unrelated photo cover, to the story so completely propped up by coincidence that it almost becomes comedy, to the extremely workmanlike and borderline bad art. It's plain to see that there wasn't much real effort put into this comic. It's really sort of a shame, because the elements of a really cool 4 way classic monster vs. monster battle are there for the taking. Vampire vs. Mummy AND Werewolf vs. Evil Sorcerer. How can that go wrong? Unfortunately, the creative team on this comic FOUND a way to make it wrong. I have 6 issues of Gold Key's Dark Shadows in my collection. I picked this one because it looked like a lot of fun on a flip through. I sort of wish I had picked another one now. And so there it is. . .the final piece of Longbox Junk's Halloween for this year. A bit of a disappointing close, but it was fun party while it lasted. Back to Longbox Junk business as usual! I sort of noticed during my Halloween party that I need to up my Marvel comics game a little bit, so how about we spend November in the Marvel Universe? Let's start with some Moon Knight! Shadowland: Moon Knight 3 issue mini. The most recent Dark Shadows Gold Key comic I've read is issue #30, and they came up with a decent plot for it. Too bad this one didn't work for you. I'm looking forward to your Moon Knight summation in your next blog! I looked at issue #14 of Dark Shadows, about Barnabas getting trapped in a haunted painting, and realized THAT was the one I should have reviewed. Art's not much better, but the story is considerably tighter.